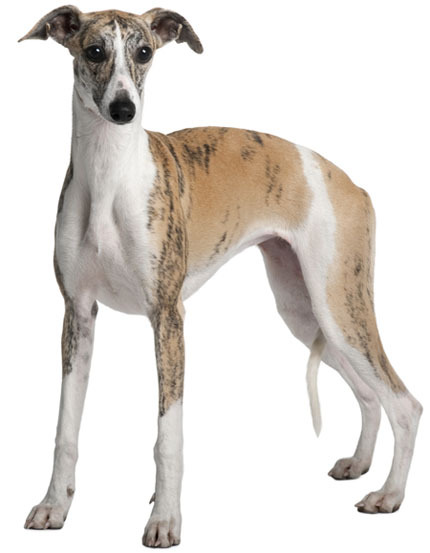 Learn about the temperament and personality of the Whippet. Discover what he's like to live with, his traits and characteristics and how he generally behaves. And look at lots of Whippet photos. This sleek and speedy sight hound makes an excellent family pet. They are gentle, affectionate, friendly, and easygoing. As puppies they can be a bit mischievous, and are prone to chewing and counter-surfing, but by the age of two, and sometimes sooner, the Whippet has usually settled down and settled in. They love to curl up beside you on the couch and sleep with you in your bed, under the covers. They are people-dogs and want to be with their family. If you go to the store, expect an exuberant welcome home ten minutes later. He might even try to knock you over. Whippets need regular exercise, and they like to run. It is important to keep them safe on lead or in a fenced-in area as they are fast and impossible to catch and they can see for miles. They will chase anything that moves: cats, squirrels, plastic bags. And they are not road smart. They generally do well with other dogs, and they seem to have an affinity for children. Of course, it is important that the children know how to treat a dog. They do not make very efficient watchdogs. They are trusting and unsuspicious by nature, and they may or may not bark at a burglar. In general, they are a very quiet breed. They are highly intelligent and trainable and have excelled in obedience, flyball, agility, rally, lure coursing, and straight racing -- basically anything you ask him to do, he'll do, as they are eager to please. They will want to go for a daily walk, no matter what the weather, and no matter whether or not you want to. They are lively and alert, but not high-strung. They are easy to housebreak and will usually follow you to the bathroom to make sure you've got it mastered too. They are funny, clever, playful, sensitive and always in love with their families. They need human companionship and do not do well if left alone. They truly want to be by your side at all times, unless of course, they are leaving you to chase a Frisbee, or a ball, or a cat. The Whippet is moderately easy to train. He learns new commands at the average rate. He is neither difficult nor easy to train. The Whippet sheds practically no hair at all. You'll virtually never find a hair in your home!